17 7/8 by 21 1/2 in. 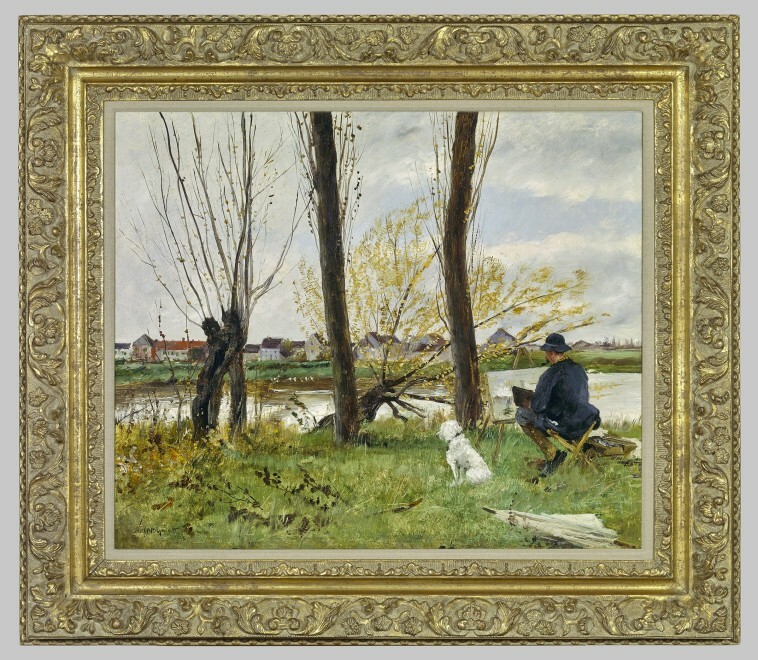 Painted in 1893, Goeneutte has shown a plein-air artist working on the banks of the Oise. 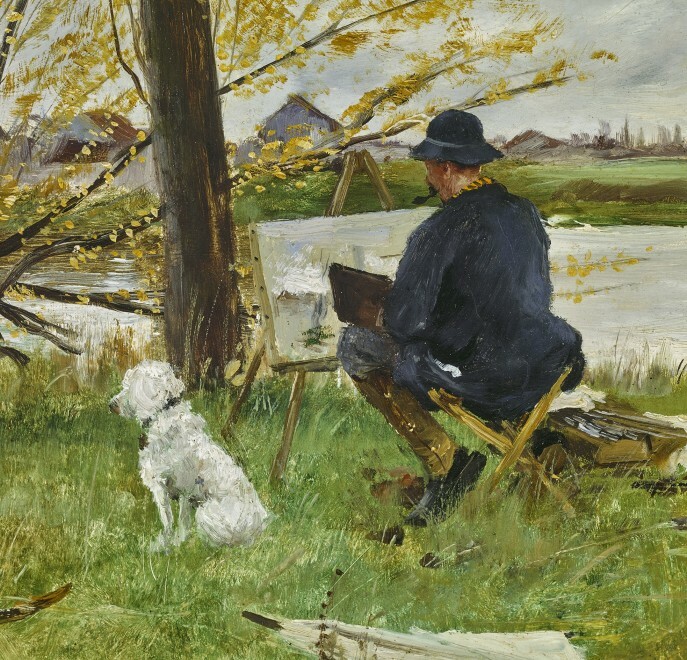 Seated on his folding chair, easel in hand and paint box by his side, his small white dog is his only travelling companion. Located eighteen miles northwest of Paris, Auvers-sur-Oise became a popular artists’ colony in the mid-19th century. It was initially discovered by Corot and then in the 1860s by Daubigny, who eventually chose to settle there. With its charming village and picturesque location on the Oise River, easily reachable by train from Paris, Auvers continued to appeal to the next generation of artists; frequent visitors included Pissarro, Renoir, Cézanne, Gauguin and Van Gogh. 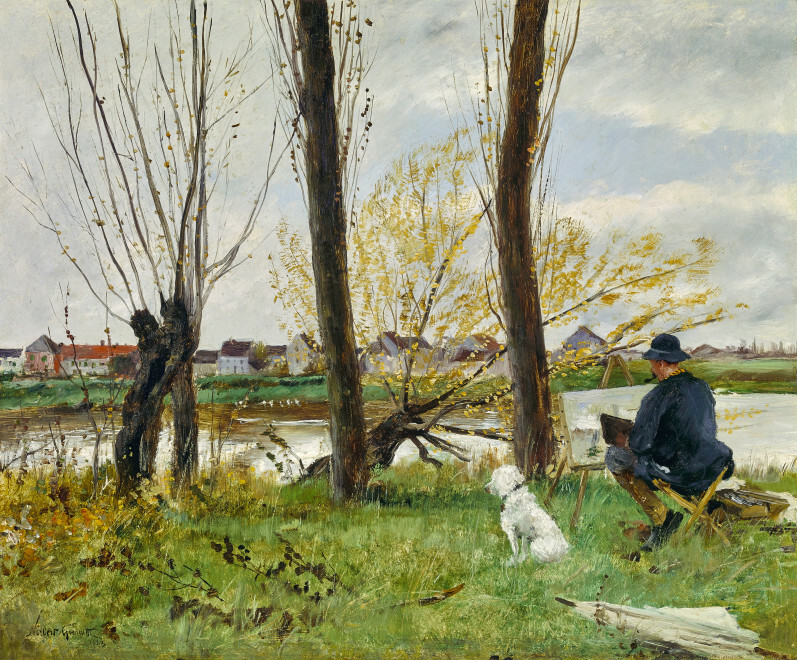 The bucolic setting also attracted Norbert Goeneutte, who moved there in 1891, and remained until his death in 1894. 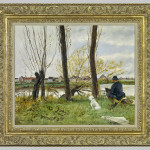 Painted in 1893, Goeneutte has shown a plein-air artist working on the banks of the Oise. 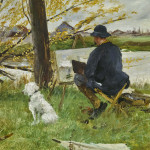 Seated on his folding chair, easel in hand and paint box by his side, his small white dog is his only travelling companion. Perhaps it is early springtime, judging from the small buds that appear on the trees and we may guess that this is one of the painter’s earliest outdoor outings after the winter months. Unfortunately, the identity of the artist remains a mystery, as does the painting on his easel. 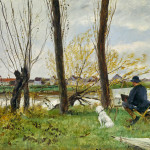 Yet, even in his anonymity, this artist may be seen as representing any number of the painters, who made the journey to Auvers to work along its scenic riverbanks.